Three media screw-ups in eight days on one investigation. The bad week for big news has President Trump feeling that he has moved the "fake news" argument from the fringe to the conservative mainstream, according to close Trump associates. Why it matters: The mistakes — ABC's Brian Ross on Michael Flynn's plea, financial outlets on a Mueller subpoena of bank records, and CNN on an email about WikiLeaks — give Trump fodder for one of his favorite, and most damaging, tropes. His argument isn't broadly true: Most reporters work hard to be fair and accurate. And national outlets have risen to this historic era with unprecedented resources and consequential journalism. But, but, but: The foil helps Trump keep his rock-solid base, despite his broad unpopularity. Based on past performance, look for POTUS to amp up his mocking. A source close to the White House told me: "He just hammers something into submission, whatever it may be. ... With the media, he just wears it down, wears it down, then somebody slips and makes a mistake." "Putting aside the impact on the long-term health of the important role that the media plays, it's starting to really work." Sen. Lindsey Graham (R-S.C.), who has often needled Trump, tweeted Friday: "I will be challenging Rs and Ds on Senate Judiciary Committee to support a Special Counsel to investigate ALL THINGS 2016 — not just Trump and Russia." More Graham: "It's long past time for a Special Counsel to investigate Clinton email scandal, Uranium One, role of Fusion GPS, and FBI and DOJ bias during 2016 campaign." Key Republicans even think the yearbook-inscription revelation by a Roy Moore accuser helped the party's disgraced Alabama Senate candidate seal the deal. All these threads let conservatives feel vindicated in their belief that the system is rigged against them (even though they control the whole government). 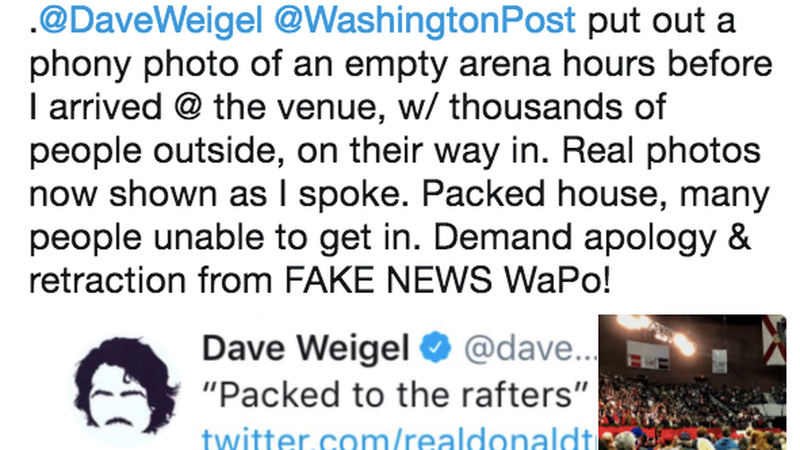 In a wild Twitter exchange last evening, Trump jumped on Washington Post political reporter Dave Weigel -- a favorite on journo-twitter -- for a sneering tweet about the crowd size at Friday night's Pensacola rally. Weigel — who had deleted the tweet, of a partly empty arena that was packed by show time — responded: "Sure thing: I apologize. ... Very fair to call me out." Trump didn't accept: "@daveweigel of the Washington Post just admitted that his picture was a FAKE (fraud?) showing an almost empty arena last night for my speech in Pensacola when, in fact, he knew the arena was packed (as shown also on T.V.). FAKE NEWS, he should be fired." Adam Serwer of The Atlantic was among those who pointed out that a head of state "publicly calling for a journalist to be fired is a textbook threat to freedom of speech." CNN's Brian Stelter noted: "By including Dave Weigel's @ handle, the president's statement is inviting followers to gang up on a reporter." Be smart: This is a battle of epic proportions. We have a president waging a relentless war against all media, minus Fox News and pro-Trump organs. The vast majority of one of our two political parties agrees with him and increasingly sees media as an enemy of the state. Only strong, responsible, accurate, non-hyperbolic journalism can withstand the assault. Make no mistake: This was a terrible week for the cause. After Trump tweeted that CNN International "is still a major source of (Fake) news," Libyan media published an article questioning the authenticity of a major CNN report on the Libyan slave trade. In the U.S., numerous reports from Alabama quote Trump voters who say they don't believe the national media, and think there's a conspiracy against Roy Moore. See examples from around the world. Read this sentence twice to understand this year and Trump: "Before taking office, Mr. Trump told top aides to think of each presidential day as an episode in a television show in which he vanquishes rivals." That's from a juicy N.Y. Times tour de force on the president's style and habits, "The President vs. the Presidency ... Inside Trump's Hour-by-Hour Battle for Self-Preservation," by Maggie Haberman, Glenn Thrush and Peter Baker. "Around 5:30 each morning, President Trump wakes and tunes into ... CNN for news, moves to 'Fox & Friends' for comfort and messaging ideas, and sometimes watches MSNBC's 'Morning Joe' because, friends suspect, it fires him up for the day." "Trump spends at least four hours a day, and sometimes as much as twice that, in front of a television, sometimes with the volume muted." "Watching cable, he shares thoughts with anyone in the room, even the household staff he summons via a button for lunch or for one of the dozen Diet Cokes he consumes each day." "Trump is an avid newspaper reader who still marks up a half-dozen papers with comments in black Sharpie pen ... [Steve] Bannon has told allies that Mr. Trump only 'reads to reinforce.'" "As he ends his first year in office, Mr. Trump is redefining what it means to be president. He sees the highest office in the land ... as a prize he must fight to protect every waking moment, and Twitter is his Excalibur. Despite all his bluster, he views himself less as a titan dominating the world stage than a maligned outsider engaged in a struggle to be taken seriously." "Trump still takes shots at Mark Cuban, a fellow rich-guy reality star, and expresses disappointment that Tom Brady ... has distanced himself." After dinner, he "sometimes 'hate-watches' CNN to get worked up, especially Don Lemon." "In between, it is time for phone calls ... In recent weeks, Mr. Trump's friends have noticed a different pitch, acknowledging that many aides and even his own relatives could be hurt by Mr. Mueller's investigation. As for himself, he has adopted a surprisingly fatalistic attitude ... 'It's life,' he said of the investigation." "From there it is off to bed for what usually amounts to five or six hours of sleep." P.S. The article has this footnote: "Glenn Thrush contributed to this article before he was suspended pending the result of an investigation into allegations of inappropriate behavior. Matt Apuzzo also contributed reporting." "Beginning Monday night, the conflagration has been indiscriminately cruel, incinerating homes, killing horses and up-ending lives. It has touched mogul and farmer, homeowner and renter, young and old alike." "Flaring up almost at random, it has linked disparate cities and neighborhoods — Ventura and Sylmar, Santa Paula and Bel-Air, Malibu and Bonsall." That would be the most women House candidates ever. One reason: Following Trump's election, and particularly since the Women's March the day after his inauguration, women have been more "energized" and "driven to get involved," per the N.Y. Times. Another factor is the sexual harassment awakening that has taken the country by storm. Trump said "black homeownership just hit the highest level it has ever been in the history of our country." Not true or even close. The U.S. Census finds that the black homeownership rate peaked during 2004, when 49.7% of black households owned homes (the rate for all races that year reached 69.2%, also a modern record). This year: 42.7% in the first quarter, 42.3% in the second and 42% in the third. Quarterly rates this year for the total U.S. population: 63.6%, 63.7% and 63.9%. Trump said he's "already signed 88 pieces of legislation. We get no credit. ... [I]n 10 months we've passed more during this period of time than any other president in the history of our country and the second — let's call runner-up — is Harry Truman." Trump's first-year legislative record pales next to that of a variety of presidents (Franklin Roosevelt, with his New Deal, signed 14 historic laws in his first 100 days). The tax package Trump may soon sign would mark his first major legislative achievement. Trump recounted a conversation with Canadian Prime Minister Justin Trudeau about trade: "He said, 'I'm telling you that Canada has a deficit with the United States.' ... [W]e actually have a $17 billion deficit with Canada." Trudeau is right that the U.S. has a trade surplus with Canada. Trump said his critics "don't want to accept the results of an election where we won by a landslide." His winning margin in the Electoral College is far closer to the narrowest win in history than to the widest. Trump: "Since the election, we have created more than $5 trillion in new economic wealth just in the stock market alone. We're not including real estate and other values. $5 trillion." According to the Federal Reserve, household wealth has risen by about $5 trillion since the end of last year, but that figure does include home values. Trump: "You know, we have factories pouring back into our country." Spending on the construction of factories has dropped 14% over the past 12 months. There has been a steady decline in spending on factory construction since the middle of 2015. The existing manufacturing sector, though, has been doing a steady dose of hiring. This appears to reflect the synchronized global growth. Trump: "By the way, wages — starting to go up. First time in 20 years." The latest jobs report shows average hourly earnings up 2.5% over the past 12 months, roughly the same pace of growth as the year before. Sydney Wiseman, a brand manager at the Canadian company WowWee, which created the Fingerling, one of this year's hot toys for the holidays: "You know you can trust a toy company if its toys fart. It knows what kids want." Key stat: "[T]he plan would cut taxes for businesses by $1 trillion, would cut an additional $100 billion in changes to the estate tax for the wealthy, and spreads the remaining $300 billion over 10 years among all households at every income level." Why it matters: "[I]t amounts to a massive corporate tax cut, with uneven — and temporary — benefits for the middle class that could end up increasing taxes for many working families in future years." Tick-tock on how it happened. "Financials, once again, are Wall Street's favorite stocks for the new year. The industry should be helped by higher interest rates, lower taxes, and an economy growing by nearly 3% a year." "Tech stocks led the market for most of this year with a gain of 35%, helped by an even more powerful rally in the so-called FANGs: Facebook, Amazon.com, Netflix, and Google, owned by Alphabet." "At 17.7 times next year's estimated earnings, tech valuations aren't cheap, but they're well below valuations in the dot-com era, and underlying earnings growth is strong." Reliving 2017, in 30 images ... Terrorism kept Western Europe on edge all year. In London in March, police forensic officers worked in Parliament Square below a statue of Winston Churchill outside the Houses of Parliament, after a knife-wielding man went on a deadly rampage. He first drove a car into pedestrians, then stabbed a police officer to death before being fatally shot by police within Parliament's grounds. At least four people, including the assailant, were killed and at least 40 injured. "The audience at Saturday's downtown Los Angeles Star Wars premiere took to Twitter after the screening to share thoughts on Disney and Lucasfilm's latest, which hits theaters" Friday. Josh Horowitz, MTV News correspondent: "THE LAST JEDI has more goosebump moments than any Star Wars movie I can remember. I was grinning for most of the 2 and a half hours. A worthy and great Star Wars film. The franchise is in great hands. Kudos to @rianjohnson." More Josh: "AVOID SPOILERS. Most of the best moments are not in any trailers."